I spent a couple of hours shooting on the streets on Friday--something I haven't really done for a while. 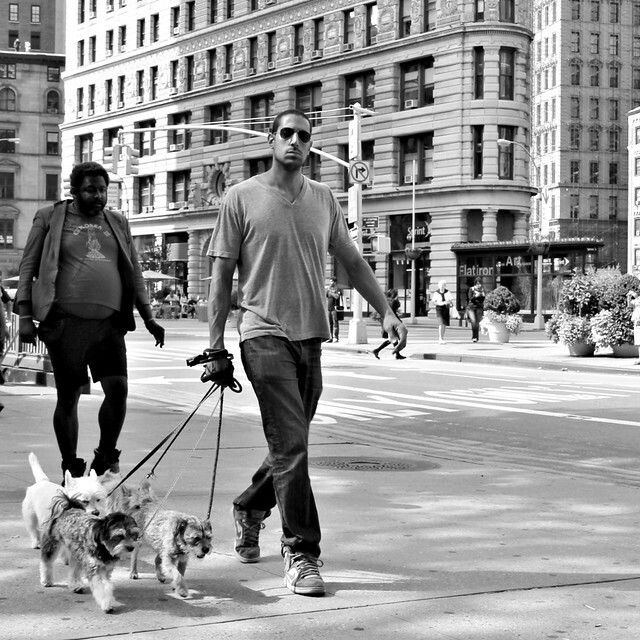 I got a few good shots, including the one below of this man who I believe to be a dog walker. I didn't notice the man walking behind him until I got home. I think he adds a certain bit of wonder to the photo. I kind of want to know what his story is. After capturing life on the streets for a while, I headed into Madison Square Park and saw this cool art installation. This 44 foot tall fiberglass sculpture was made by Spanish artist Jaume Plensa. 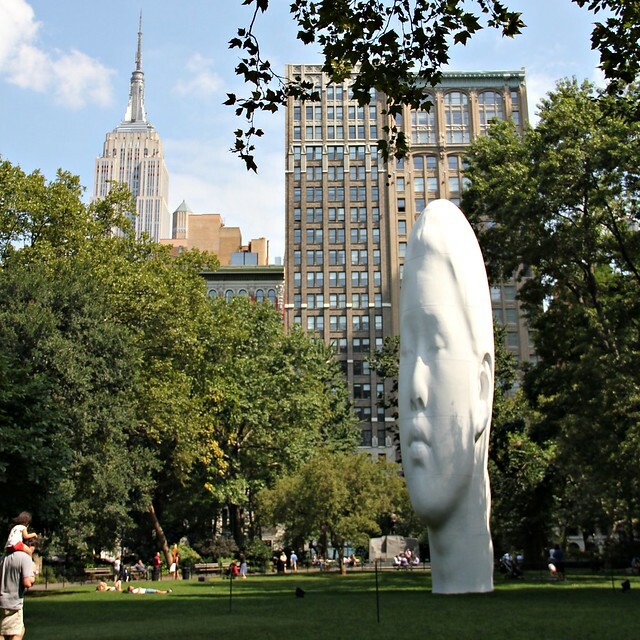 You can often find interesting public art in and around this park which covers a few blocks between 5th Avenue, Madison Avenue, 23rd Street and 26th Street. Unfortunately, I don't get there to see them all, but I blogged about one of my favorite art installations near this park last year if you want to check it out. I hope you all have a nice Labor Day! Linking up today with Lisa at The Creative Exchange. Love your photos. The street scene is fantastic (loving the chap behind the dog walker! )- I'm always too chicken to photo street scenes but this has really inspired me to have a go. Love the art installation too - can't believe it's so big! I always wish that I lived closer to a big city when I view your blog. Love the characters that you capture! Those two work especially well in B&W. Outdoor art, what a treat. This sculpture is a beauty! The outdoor experience is unique in that you also get to see the effects of light and cast shadow from different objects, such as the trees. Delightful! For some reason NYC seems like it needs to be shot in Black and white...I love the photos! Oh thank you for sharing such wonderful photos of the city I miss SO! I do so enjoy your blog my dear! I agree that the second man adds a special touch to the dog walker. I also agree black and white does NYC real justice. I so love your street and city scenes. I went to Boston on Saturday and have even more appreciation for the images you capture. That huge sculpture is cool. Must have been dramatic up close. I have a friend who is into Bread and Puppet-due to their large scope. You might google them and check them out. Very cool! At first I thought you edited that photo, that sculpture really makes you look twice. I love art like that! really love the black and whites you do those wonderfully! If the giant sculpture can manage to turn his head... just a little bit further... he's almost got a wonderful view of the Empire State Building. All very, very cool, U.M.! Love the dog-walker photo, makes you really think and wonder. Your b&w photography is amazing!! Perfectly candid, and I too wonder what his story is! Mmm. Love that area, and for whatever reason, I just don't get down there enough. I really like the art installations in Madison Square Park. Quite a lot. I love that first shot too. The guy behind the dog walker is very interesting. Love the first shot. Really shows you the diverse city streets. Great work. I agree with Em. B&W certainly agrees with NYC. I love the art installation, too! Love the dog walker shot! the dog waker is amazing but the guy behind him... brilliant!